I just realized that much of this post was chopped while posting. Alas, I don’t recall what I said so… you still have the second half of the post. 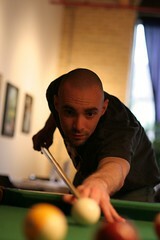 In addition, Darren Rowse has taken some fantastic picture of some of our social events, etc. Check them out. I’m also really thrilled to meet Chad, our director of sales, Gary who has been doing a lot of our development and support and Darcie “Prairie Fire” Vany, the new Office Manager. It’s really quite amazing how well this team works together.